20th Century Fox has bought the rights to the BOOM! Studios graphic novel Goldie Vance with Kerry Washington and Rashida Jones teaming up to bring Hope Larson and Brittney Williams’ comic to the screen. Described as a mix between Nancy Drew and Eloise, the book follows 16-year-0ld Goldie Vance, who wants to become the in-house detective of a historic Miami hotel. When gets involved with the dealings of an international crime ring, it proves to be a bigger challenge. Jones will adapt and direct the movie with Washington producing via her Simpson Street production company, overseen by Pilar Savone. BOOM! Studios’ Ross Richie and Stephen Christy are producing along with Adam Yoelin as co-producer, and Daria Cercek and Jon Wu overseeing for Fox. BOOM! Studios has certainly paved its own way as a comic publisher in recent years, making comics that can appeal to readers of all ages and genders. 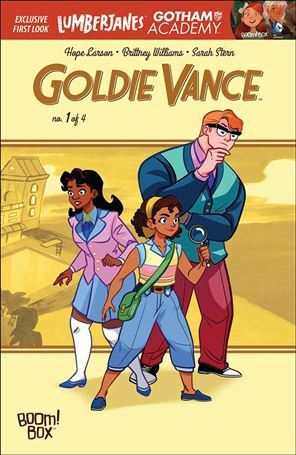 Goldie Vance looks like a comic that can appeal to younger girls, and one assumes the movie Washington and Jones makes will be similarly family-friendly. There’s no word whether either of the actors might take a role in the film or remain behind the camera. Repped by CAA and Washington Square Arts, Washington has been a prolific film actor for many years before snagging the role of Olivia Pope on ABC and Shondaland’s popular drama Scandal. She set up Simpson Street last year to produce HBO’s Confirmation, which received an Emmy nomination in the outstanding movie or miniseries category. Jones is currently appearing on the TBS comedy Angie Tribeca, and she co-wrote a recent episode of Netflix’s sci-fi anthology Black Mirror, as well as being an EP on TNT’s Claws. She recently walked away from working on Pixar’s Toy Story 4 with her writing partner Will McCormack, and she’s repped by UTA and James Adams.